Surprisingly #2 was the preferred one and I would have bet on #4 due to the crunch – it was my favorite and I think it would have won with more spices in it. If you have a go-to fish coating, I'd appreciate getting it as I'm always looking for a better one. 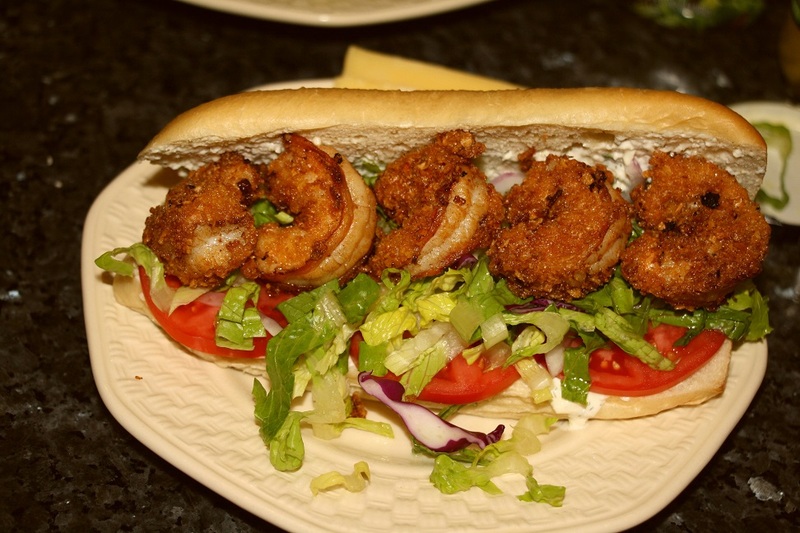 I’ve said all of the above to get to the point of saying we had some raw shrimp and grouper left over and decided to turn them into Po Boy’s using some rolls we also had on hand. Bev had half grouper and half shrimp but I failed to get a shot of hers. Mine was shrimp, which I dunked in buttermilk then dredged in a mixture of House Autry and cornflakes. I nuked the bun for a few seconds to soften and warm it then mostly split it and added some creamy feta salad dressing to one side. Then I added tomato, a little onion, and lettuce before adding the fried shrimp and baby Swiss cheese. It was very good but I believe I would have preferred cheddar cheese. While the shrimps were delicious, I think smaller ones would work better as they could be packed in easier for an over stuffed sandwich. While we were out west last fall, our neighbor, Pat, ate Stuffed Green Pepper soup at a restaurant and loved it so Bev has been waiting for our travels to end so she could make a batch. 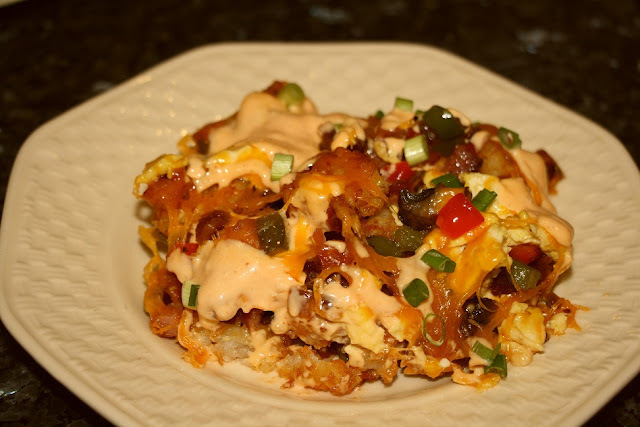 When Kathy over at A Spoonful Of Thyme posted this recipe I knew it was to be in my future and we finally got around to making it, and sure glad we did. Please check out her site for some good photos of the dish. I made it with only slight alterations but pretty much followed the recipe. And now for the rest of our meal with Laurie and Dave. We had watched Mario Carbone (Chef and co-owner of Carbone in NYC) make Italian Wedding Soup on the Today Show the other day and since it was on my make-someday-list, we decided to give it a try, especially since Bev was making some meatballs that day – while the recipe calls for chicken, she just made a smaller version of her beef meatballs. 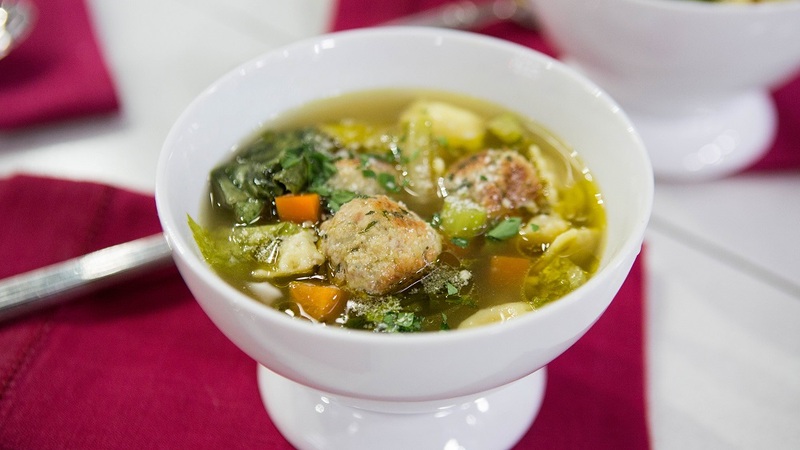 Even though there are simpler versions of this soup, we decided to make this one with two changes – the meatballs and spinach in lieu of escarole (which many recipes do). Since we were serving it to company and wanted to make meal day easier and less messy, we cooked the meatballs and made the broth the day before and sauted the soup veggies the morning of. Click on the title below for the full recipe and this shot is from their site. Friends Laurie and Dave (Big Daddy Dave) joined Cindy, Bev and I for a little dinner get-together the other night and as I was writing the blog I realized I had too much to say for one post so I broke it into two beginning with the appetizer and wine. 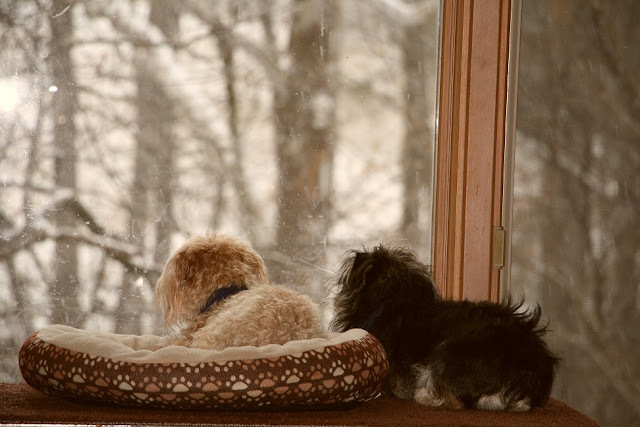 But first, here is a shot of Teddy & Romeo watching our recent snow. I’ll bet this title got your attention but it’s not as bad ad it sounds. Bev makes food for our four legged children and this time by cooking chicken, carrots, sweet potatoes, and spinach in water – sometimes she roasts them. While different than the usual, chicken and veggies cooked in water is how stock is made so we decided to give this broth a try as soup even though it was a little sweet. 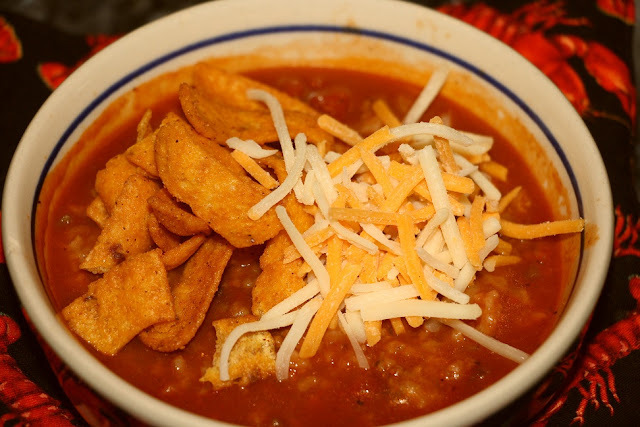 The recipe we decided to use was Steph’s recently posted Crack Chicken Noodle Soup from her Plain Chicken Blog – check it out for some great pics. For the soup, we cooked a couple more large breasts in the broth to get the cooked chicken we needed then adjusted her recipe for our eight cups of broth (hers is for 6 cups). 1. In a large pot, combine cooked chicken, cheese soup, chicken broth, milk, chopped celery, sliced carrots, Ranch Dressing Mix and Bacon Bits. 2. Bring to a boil over medium-high heat. Reduce heat to simmer and cook for 20 to 25 minutes, until vegetables are soft. 3. Stir in dried noodles, peas, and shredded cheddar cheese. Cook until noodles are soft. Despite the slightly off color (due to the spinach) and the sweetness, I thought it was very good and would make it again. Thanks Steph. 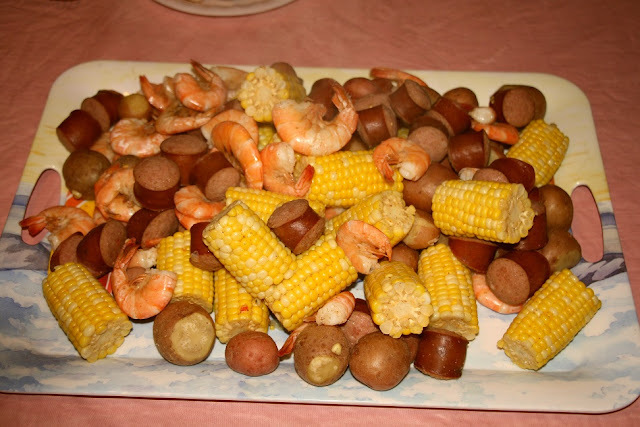 I’ve posted about Low Country Boil (Frogmore Stew) before but it has always been cooked outside in a giant pot and dumped on a paper covered table for eating but this time, at 20F outside, it was all done inside. Mostly I’m posting this to document this recipe for one of our favorite meals. We were originally planning for 10 diners but ended up with six, so the food I had was too much and the numbers in ( ) are what I would cook for eight. Bring water and seasoning to boil in a large stockpot. Add potatoes and cook for 5 minutes. Add sausage and cook for 10 minutes more. Add corn and cook for another 5 minutes. Turn off heat, stir in the shrimp, and cover pot until shrimp are pink, 3-4 minutes. Drain immediately and serve. Rather than dump on paper and eat without plates, we poured it onto a serving tray that we could slide up and down the table for serving then ate from paper plates so very little clean up needed for this one pot meal. If you enjoy grits but have never had the real deal, stone ground, whole kernel variety, you are missing out on a real treat. We have a few bags of them in the freezer (these came from White's Mill in Abington, VA) but rarely make them due to the 60-90 minutes of near constant stirring required to cook them properly. Bev said she wanted some and suggested the crock pot so I went online and surprisingly found this recipe that cooks them all night to be hot and ready by breakfast time. 2. Stir together grits, salt and water in the crock pot. Cover and cook on LOW for 7-8 hours. 3. Remove lid. Scatter butter on top. Use a whisk to stir the grits until they are an even consistency and the butter has melted. 4. 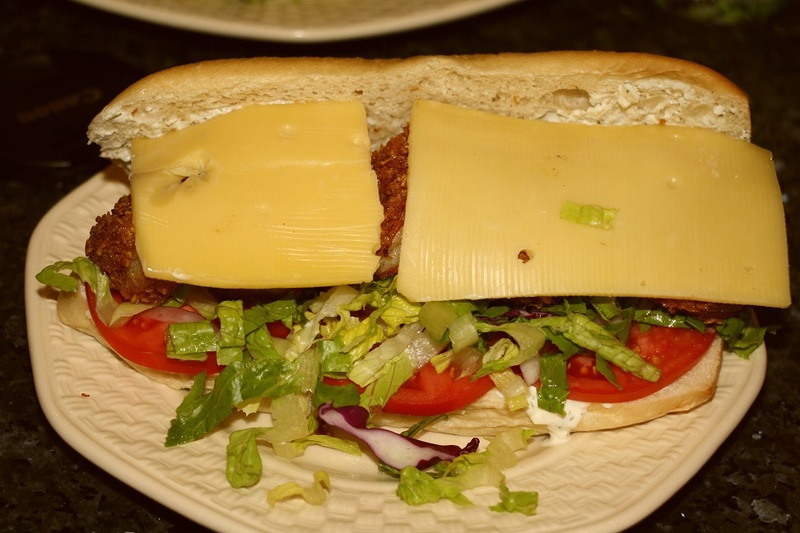 Sprinkle cheese on top and add pepper to taste. Our original plan was to start home on Jan 3, but after two days of cold and rainy with more to come and nothing else we really wanted to do, see, or eat, we decided that rather than hang around waiting to go home, we’d just hit the road. So we pulled out around 10am on Saturday and headed for Gadsden, AL for the night at Cove RV Resort and Campground. The Cove is a little over a year old and has a ways to go to be a good campground, much less a resort but it was adequate for an overnight stay. They have a good location, some nice facilities, and a good WiFi but their sites need a lot of work to be level and a little wider. We traveled FL-87, US-31, I-65, I-459, and I-59, I-24 and I-75 - the road surfaces were all good but I-59 which was a little rough due to the cracks above the old concrete joints. We got home about 2pm on New Year’s Eve, and as my hands were freezing while I topped off the fuel tanks, I could only ask “what were we thinking leaving FL for this weather – it was 11 overnight and expected to be this way all week. Rather than come home four days early, we should have extended for four days – what was I thinking (or not). I thought it was a very good trip and I would not hesitate to stay in the same locations again in Ft. Myers, Dunnellen, East Point, and Navarre – I really enjoyed the less crowded parts of Florida and the plain ole country folks (their words) in the East Point/ Apalachicola area. The campgrounds were all good, we saw some interesting sites, and ate some excellent seafood – I could have eaten it every day and I didn’t miss many. We came home with a freezer full of shrimp, oysters, and fish and already have a plan for a good portion of it. Thanks for following us along on our journey. Thursday turned out gray and rainy so we didn’t plan much but eating out for lunch and based upon the recommendation of fellow campers, we opted for Johnny Huston’s Grille & Bar. It looks more like a sports bar on the inside with many TV’s tuned to various sporting events.